The dramatic headline immediately grabbed my attention — that could have been me. Because if I had been sitting in my paid seat, headed home from my first trip away from my still-nursing baby, you would have had to drag me off the plane too!! Except I wasn’t even allowed on my flight. The United gate agent slammed the jetway door in my face. Flight overbooking is an increasingly common practice where an airline sells more tickets than a plane can accommodate. As a result, ticketed passengers are denied entrance to their paid-for flight. Travel plans are disrupted, work missed, and in extreme cases there have been violent confrontations. I’m sharing my story because I want people to know that the news article I mentioned above is not an isolated incident. 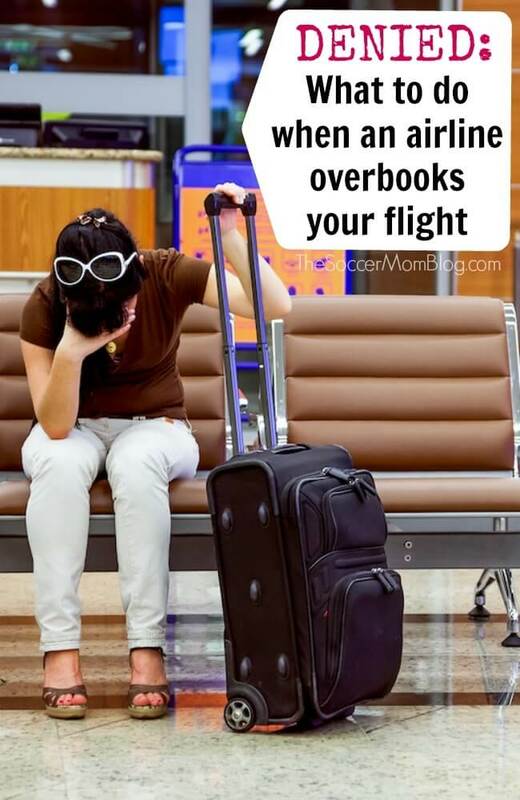 Overbooked flights happen every single day. But they shouldn’t. And no one should get hurt because they’re sitting in their ticketed seat! I ran through the potential blog post titles in my head as I waited in line to board my flight from Albuquerque to Houston. New Mexico is one of my favorite states to visit and I was excited to write about my first stay in the capital city. Then the door slammed in my face. I think my mouth actually gaped as the warning bell rang and the ticket agent shut and locked the door to the jetway. I practically ran from the rental car drop-off to the shuttle stop, panting from the effects of the altitude after a weekend spent in the high desert mountains. “We’re cutting this closer than I like,” I gasped back to my blogging and now real-life friend Jennifer who roomed with me at the conference. We really weren’t that pressed for time. In fact we had plenty of time to check-in, pass through security, use the potty, and stock up on drinks and snacks for our return flights. I was just ready to get home and wanted to take NO chance of missing my flight. I think I had checked my boarding pass twenty times to be sure I had the correct boarding gate and time. Excited or not, I was exhausted and a mess of hormones from starting to wean my youngest right before I left. When planning the trip, I paid extra for a direct flight so I could be home as quickly as possible. Before kids, I used to travel often for work and loved it. It’s different now. I think it is so important for mothers to do things like this for themselves, and I was grateful to be able to travel. But three days was enough and my heart ached to be home. I hugged goodbye to Jennifer, as this was where we parted ways until the next conference. I arrived at my gate twenty minutes prior to boarding and plopped down in one of the faux-leather seats that seem to be an airport staple. An announcement came on over the intercom: Ladies and gentlemen, we have been advised that we are under a weight restriction. We will need four volunteers to give up their seats. We can offer a $150 voucher for all volunteers. I chuckled under my breath. Who was going to volunteer for that measly offer? I was curious to see how high they would go, but within a couple minutes they started the boarding process so I figured it had been settled. I casually worked my way over to the line when my boarding group was called. One of my airport pet peeves are those pushy people who try to weasel their way in front of everybody. I mean, we’re all going to the same place…right? “We stopped boarding. We’re full,” the ticket agent said without a hint of feeling in his voice. I was at the front of the line, just about to scan my ticket and head down the jetway. Just about to head home. SLAM. Click. Door shut. Decision final. Like me, they all stood still in an almost silent shock. What. Just. Happened. DID that just happen? Did our plane really just leave without us? As those cold words began to sink in, I felt the tears welling up. Yup, I cried in the middle of an airport. I put my head down and covered my face, but there was no hiding it. Everyone around me ignored my sobs. I’m sure they all had their own hopes and excitement and plans for the rest of the day, and they did not include being in the Albuquerque Sunport. I might not have been forcibly dragged from the plane, but I was forced to stay off it. And while I wasn’t hurt in a violent scuffle, I was a nursing mama away from my baby for the first time. And I didn’t know when I would get home. All of us were ticketed passengers. None of us were late. We simply had not jockeyed for position in the boarding line. We were the polite and orderly passengers who figured “we’re all going to the same place, so why push and be rude?” Now I know why. Yet that is exactly what was done. Delta was happy to accommodate me to Houston, though I would not return until more than 6 hours after my original United arrival and it would technically be the next day. Their ticket agent went out of her way to make things as easy as possible for me: she moved my seat to the front of the plane so I could get off quickly and make my tight connection. She also sent my carry-on bag directly to Houston and assured me it would be faster for me that way. She was right – both my bag and I arrived as scheduled. It happens. A lot. — Less than ten years ago, I held a job that required a fair amount of travel. Most of those flights were half full. These days airlines want every single seat filled to maximize profit, so they frequently overbook to ensure this happens. You can’t always prevent it. — You can lower your chances of being bumped from your flight by being early, checking-in as soon as you are able (often 24 hours in advance online), and hurrying to get in the boarding line before everyone else. Unfortunately, pushing your way to the front of the line can be the difference between making your flight and being left out. It’s not your fault. — If you paid for your ticket and arrived on time, you should be able to board your flight. Period. And if you are denied entrance (forcibly or not), you don’t have to go quietly. I don’t mean getting into a scuffle (please don’t do that! ), but you have every right to demand that the airline make up for their mistake. It took a few phone calls, but I was refunded my money for the second leg of my flight. I was promised a travel voucher as well (since I was deemed a “volunteer” to give up my seat), but I haven’t received it yet…almost a year later. Hence the blog post. Are you listening United?? Remain calm. We’ve seen how far some airlines will go to remove passengers who don’t cooperate. But even when dealing with reps after the fact, staying cool (but firm) is more likely to get results. Don’t give up. It took tweets, emails, and phone calls, but United did eventually refund my return flight which they did not allow me to board. They might not make it easy, but you shouldn’t be charged for a service you did not receive. Sorry, but getting on a flight that you pay for is not a luxury. It’s simply getting what you paid for. It’s about time that airlines like United honor this basic business principle.